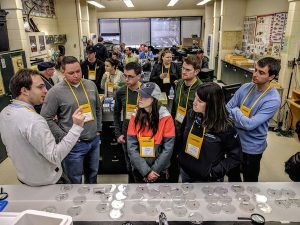 The Canola Council of Canada and the provincial canola grower organizations hosted canoLABs at Regina, Sask., Vermilion, Alta., and Dauphin, Man., earlier this year. Here are the top canoLAB messages for growers and agronomists to consider through 2017. How many canola plants do you need? 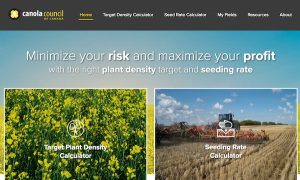 The new target plant stand and seeding rate calculators at canolacalculator.ca will help determine the correct plant stand for an individual field. What’s new in blackleg management? Using the same disease resistance genetics over and over causes a shift in pathogen population, which can then overcome the resistance in our varieties – similar to herbicide resistance in weeds. 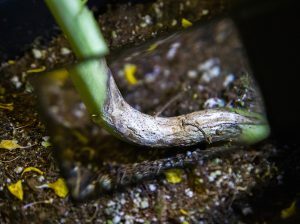 Knowing the resistance genetics used in previous years will allow growers to rotate to a different resistance gene and reduce the blackleg infection within a field. As many as 10 new blackleg resistance labels will be applied to varieties in the coming years. They will use these letters A, B, C, D, E₁, E₂, F, G, H, X to identify major resistance genes present. How early is too early to seed? Past experience would suggest that starting on peas and maybe some cereals in mid April would be the preferred early-seeding choice, with canola going in late April and early May. Growers may see value in experimenting with one early-seeded canola field, but other crops tend to be better options for seeding in mid April. If growers can’t get on the field yet to finish harvest 2016, they can hand-thresh a sample from the windrows. This quality preview can provide an estimate of grade and help you determine what to do with it. This is the 50th anniversary of the canola industry association. In 1967, growers, seed developers, processors and exporters formed the Rapeseed Association of Canada, forerunner to the Canola Council of Canada. It is the first industry association in Canada to encompass all links of a value chain. Want to help out with a research project. Fields are needed for Ultimate Canola Challenge trials, AAFC research into habitat enhancement and pollinators, University of Calgary research on landscape features and their effect on yield, and validation of lygus and flea beetle thresholds. Clearfield variety 46A76 has been de-registered by its registering company. Registration will be cancelled as of August 1, 2017, which means 46A76 crops harvested after that date cannot be legally delivered into the grain system in Canada. For this reason, growers should not grow 46A76 this year. With a late harvest in many fields last fall, growers may have missed the opportunity for fall weed control. That could mean higher levels of winter annuals and perennials this spring. The delayed harvest could also mean higher amounts of volunteer canola seeds. This could be a big year for volunteer canola. 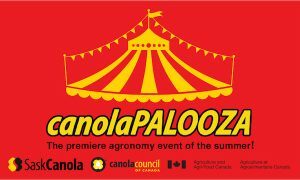 canolaPALOOZA is a carnival-like event with games, food and fun to make plot tours and agronomy messages more interesting and memorable. The June event has no fixed schedule, so you can visit agronomy-themed stations as often as you like and for as long as you want. Researchers, extension staff and CCC agronomy specialists deliver messages and answer questions at each station. Tom Wolf, owner of AgriMetrix in Saskatoon and long-serving spray applications researcher, says higher water volume doesn’t necessarily increase herbicide performance, but it improves the consistency of performance.